I have written so many times about music and my teaching. I literally have been using music in my classes for the past 37 years! Yes, I know, I’m ancient. What doesn’t ever get ancient is the music. This post is going to be a bit different. I’m trying to consolidate; instead of writing a post about a specific unit I am going to simply list all of my units and the music that anchors each of them. There is NOT ONE unit that doesn’t begin with music, not one. Music is always part of my “hook”. It may not be the only hook, but it always is one of the hooks and the music “plays” on throughout the entire unit. The Heart wants what it wants (Spanish version of the Selena Gomez song), Kevin, Karla y la Banda My story ended with this expression and song. 9. Bianca Nieves y los siete toritos, the novel, written by Carrie Toth I taught this in Spanish III and IV this year due to some extenuating circumstances (having to pick up a 6th class in March, no more funding for a new book, etc.) Next year I hope to have the novel Felipe Alou, Carol Gaab, here. Yesterday, one of my Twitter colleagues remarked how much she enjoys using music in her Spanish classroom. 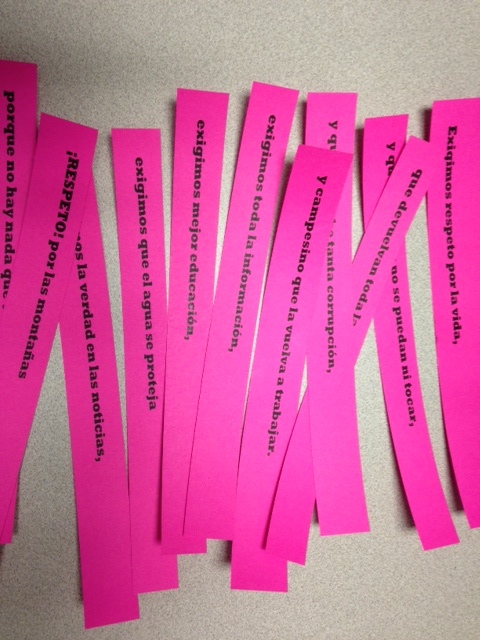 She continued by asking what else could she do with a song other than have students complete a cloze activity. It’s very hard to give an answer to that question within the 140 character limit. Therefore I am going to share some of the ways that I have used a song recently. 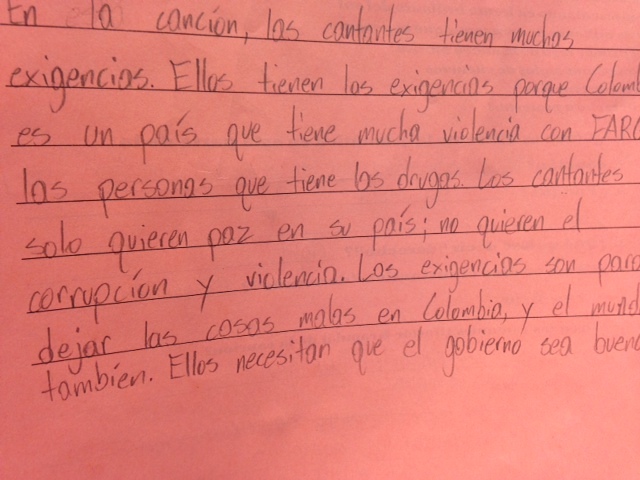 My Spanish III classes have just begun a Colombia/Juanes/Social Awareness unit and my Spanish IV classes have just finished the novel Vida y Muerte en la Mara Salvatrucha. An oldie, but a goodie…..La Historia de Juan (Juanes). Everyone has heard this song and knows that it is filled with preterite verbs. There are several activities that I do with this song, but one of the newest is this document La Historia de Juan que representan las fotos (see the pictures below). After we have worked with the song , I will have the students first identify what the pictures mean in relationship to the song; next I will have them attempt to recreate a line from the song; finally, they will have to attempt to put the pictures in some order, with lyrics, that will make sense. It may not necessarily be the same order as the song. For another old song, A Dios le Pido, BEFORE my students had any exposure to it, I gave them 12 strips for the first part of the song. Working with a partner, they read through the lyrics, in whatever order they got them, and tried to understand as much as possible. We shared this in class and then made guesses as to what the song might be about. Their guesses ran basically along these lines: someone is in love, someone is sick, someone has Alzheimers, etc. Without watching the video while we listenend, they next tried to put the 12 strips in order. I recommend having the students derive some meaning before ordering, otherwise trying to order an unfamiliar song can be a bit daunting. It took two times listening, and they had the order. Then we watched that part of the video. It didn’t take much discussion to determine that the song was about more than they had originally thought. The second day with the song I did a type of go/stop activity (similar to MovieTalk) with the video as we identified what it was that we were seeing. We then listened again, identifying, by circling, which word was in the song (despertar, despiertan, despierten; recuerde, recuerda, recordar) . A Dios le pido day 2 Next, I had them,without looking, attempt to write down 5 things that Juanes had asked for in the song. They shared with a partner, and together, as a class, we listed as many as we could. We looked at the lyrics again and I asked them if they noticed anything different about the verbs that we had circled (brief foray into the world of present subjunctive, and I do mean brief: they have “opposite endings” and there is a “que” before them). Finally, the students determined what three things they might ask for. Enrique Iglesias and Nicky Jam released the official video for “El Perdon” last Wednesday. It was a song that had been on my radar for about a month, as I waited to see what the video would be like to determine if I was going to use it. The video is mostly decent, there are a few things that might be inappropriate depending on your school situation and level. I played it for my students as the opening music last Thursday, and predictably, they really liked it. Sara Elizabeth Cottrell posted some wonderful ideas for this song on her blog Musicuentos and I strongly encourage you to explore her blog! I did something else with the song. First, we identified every word that they knew after only listening once. We listened again, and added to the list. It was great because we have certainly been working with “estaba buscando, gritando, matando, tomando etc.” They really felt good about what they understood after just those two times. Then, I had them listen to the way Enrique and Nicky pronounced words, asking if they were the same. Of course, they are not. This led to a good discussion about the difference in Spanish from Spain and Spanish from the United States (Nicky Jam was born in Boston) when your parents are from the Dominican Republic and Puerto Rico. Their listening was intense as the picked up on the “decir” of Enrique Iglesias; the e’taba bu’cando of Nicky Jam, etc. Finally, one of the songs that I used with the book Vida y Muerte en la Mara Salvatrucha (from TPRSPublishing, was Tu Carcel. I had read about the song in another blog, and I’m really sorry that I can’t remember where (if you know, please tell me and I will credit that source). In the book, the anonymous author will eventually go to jail, but even before that happens, he is imprisoned in a jail that is of his own making/or of the gang. While the song is technically a love song, it was really easy to reinterpret the lyrics so that they applied to the narrator, the disappearance of his father, the death of his mother, etc. And that is exactly what we did with those lyrics. So, there you have it, 4 different activities that are not cloze activities, that I have used in the past 2-3 weeks. Spanish IV started the Immigration unit three days ago. I introduced it with the very popular song, Wake Me Up, from last year. It was done originally by Aloe Blacc and Avicci. Aloe Blacc (whose parents are from Panama), made an acoustic version of the song with Immigration as the video context. It was an immediate hook for my students because it was a song in ENGLISH that they already knew quite well…..but, they had never seen it from the perspective of immigration. The lyrics are the same as the original version, but they take on a completely different meaning in the context of the song. I did not use the video with them until the third day. We listened to it, did a cloze activity, practiced reading it, did some whole sentence direct translation to assist with the next step: partner work to determine meaning, identified reflexives, etc. Metas no me doy por vencido On the third day, when the lyrics were very familiar for them, and immediate comprehension was possible, I allowed them to watch the video. After watching, in small groups they discussed what they thought the video meant, what the three “stories” were in the video, etc. We continued using it all week (playing as they were working on other things, singing it when entering class, etc.). This song is also one of their five choices for their performance based task to create a visual representation of how the lyrics fit into the Metas y Sueños unit. No me doy por vencido was such a success that I was thrilled to see (via Twitter @luisfonsi) that Luis Fonsi was releasing a new song. The first activity was for them to read the boxes in the first half of the paper and to then identify as many of them as possible, with a partner. I told them that some of the words were in the song that we were going to listen to, and I asked them to check the ones that they heard or that they saw in the video. I did not tell them that EVERY box was in the video, but every box is. After a first listen, I asked them to share a few that they heard. We then listened again, and shared some more. Based on what they had checked on their papers, what they heard and what they saw, I asked them to make some guesses about what the song was about. The next day, I had them review the boxes with a partner, and then they worked through the 8 true/false statements for meaning only. We watched the video again, and they marked the true/false and tried to come up with the transportation words. There are only three in the song, but I included lo que sea because it is a phrase I want them to begin understanding/using, and it was used in context with “whatever transportation means necessary”. Individually, they completed the verb section of the paper. We did not have time to finish the synonym/ antonym section, but I will pick it back up briefly on Monday. Premio Lo Nuestro aired on Thursday night, so I shared the live performance/premiere of Corazón en la maleta. It also served as a beginning discussion about that awards show, and the situation in Venezuela that many of the artists referred to. I hope this gives you some new ideas for ways to incorporate music into your lessons. As always, I would really be interested in activities that you may be using with music. In the last post I included the activities for the first 4 days of the unit. This post includes the plans for Days 5, 6 and 7 (my class periods are just 45 – 50 minutes long). 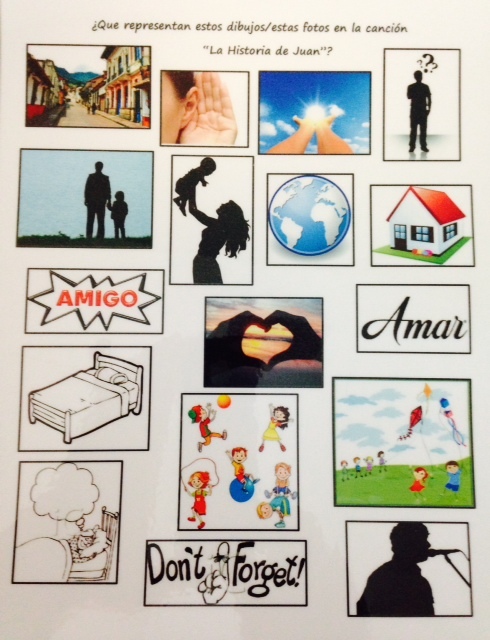 Neil Jones has a great blog with wonderful resources and ideas for Spanish teachers. 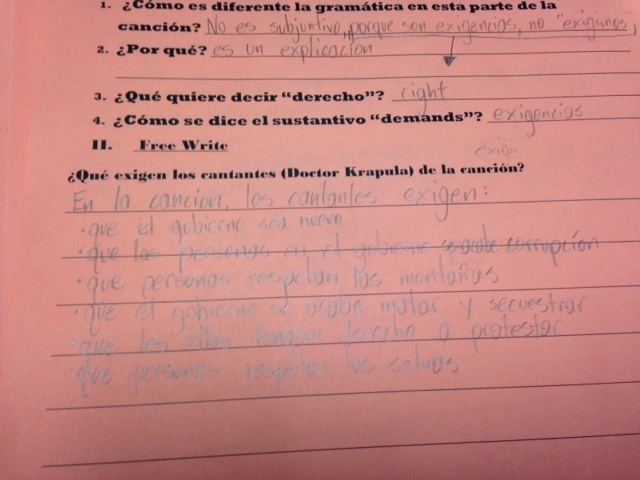 In 2012 he posted an activity: El sueño y el orgullo, that will fit nicely in this unit. 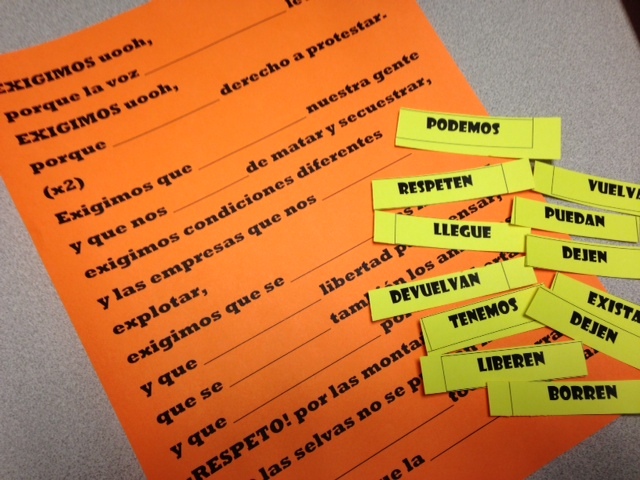 It has many of the vocabulary words that I am targeting, reflexive verbs and subjunctive. It is a good cloze listening activity that I will expand into conversation and reading. Eres la persona en la foto. ¿Cómo llegaste allí? ¿Cuáles eran tus sueños/metas? ¿Cuáles eran tus retos o desafíos? ¿Cómo lograste tus sueños? ¿Cómo conseguiste tus metas? ¿Siempre creías/pensabas que tenías éxito? ¿Tenías miedo o duda alguna vez? ¿Cómo puedes usar tu posición para el bueno, para cambiar algo en el mundo? ¿Cómo vas a alcanzar nuevas metas? Additional note: I will be speaking individually with several students over the span of several days, working toward the first evaluation in which they are to describe their own dreams and goals to me. Thoughts and comments, suggestions, etc. are always welcome!!! Our curriculum for Spanish IV says that we are in a chapter that focuses on aspirations (tough vocabulary, abstract ideas) and,…..tons of grammar (preterite of stative verbs, grammatical reflexives, preterite versus imperfect, subjunctive with adverbial conjunctions). So, am I tied to this textbook that we have been given? No! With this post I hope to encourage those of you who have a textbook that may not be the most relevant….meaning that it simply doesn’t have the authentic resources that will tie it to comprehensible input……to take part/some of what the curriculum dictates and create something that does use authentic resources. 1. ¿Qué es tu rutina diaria? ¿Cómo te escapas la rutina? 2. 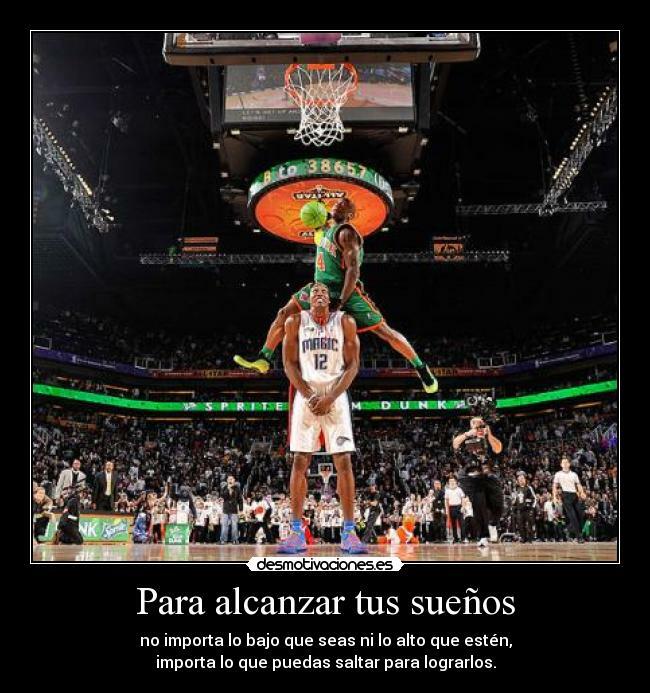 ¿Cuáles son tus metas, tus sueños? ¿A qué quieres dedicarte? ¿Cómo han cambiado tus metas /sueños desde tu niñez? ¿Cómo vas a lograr tus sueños? ¿Cómo te enfrentas a los retos, los obstáculos? 3. ¿Quién es una persona que ha superado mucho? ¿Cuáles son las características y/o las acciones de la persona que ha superado mucho? ¿Quién es una persona que admiras?¿Porqué? 4. ¿Cómo presentan los sueños y las metas las canciones y/o las películas populares? 5. ¿Cuál fue la banda sonora de tu infancia? ¿Cuál fue la banda sonora de sus años de escuela secundaria? ¿Qué crees que va a ser la banda sonora de tu futuro? I am going to try to post the various materials being used as I use them. As with so many of my Twitter colleagues (so many, but to name a few: Kara Jacobs, Sarah E Cottrell, Cristina Zimmerman, Kristy Placido, Mike Peto, Bethanie Drew, Cynthia Hitz, Carrie Toth, Amy Lenord) the emphasis for providing comprehensible input will come from authentic resources. However, I will say that with the constant weather interruptions, it has been impossible to gather momentum yet! I introduced the unit with an unusual video: Elvis Presley, singing If I Can Dream in English, with Spanish subtitles. Both days I have had Celebra tu vida by Axel playing as they come to class. I intend to use it extensively this coming week. The plan for Monday is based on a lesson that has gone well for the past 5 years, and one that came from Zachary Jones‘ older site, Actualidades. It includes a lectura, video, and a free write about Kseniya Simonova, an artist from the Ukraine who won the Ukrainian version of America’s Got Talent in 2009. Metas Kseniya Simonova If you have not heard of her, or seen the video, it really is worth watching. Each year my students have been amazed, and very moved. It has led to some rich discussion and some interesting free writes. Both the work with Kseniya and Martin Luther King are activities designed to support the oral assessment of dreams and goals as well as the written assessment on a person that they admire. Since this is a work in progress, I would really appreciate any ideas, suggestions, comments that you might have. For a couple of years I have used the song Todo Cambió by Camila when working with the preterite and imperfect. Each year, the song has been well received, but this year, the Spanish III students absolutely loved it. 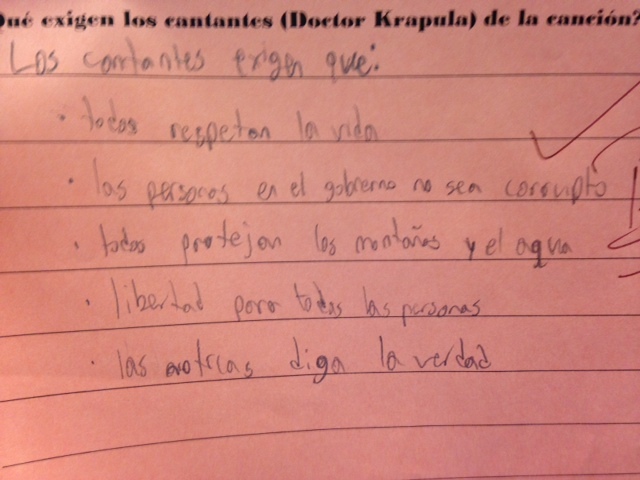 Spanish IV students have also enjoyed Llorar by Jesse y Joy and Mario Domm (from Camila). For many of them, they would list Jesse y Joy, Camila and Juanes as their favorite Spanish artists. Unfortunately (or so I thought), both Mario Domm and Samo from Camila have left the group to pursue separate careers. About two months ago I ran across the song Inevitable by Samo (after listening to what was then his new release,Sin Ti). I thought it was interesting,made a note to use it, but forgot about it. Thanks to the ever creative, resourceful Zachary Jones, I was reminded of the song again this past week when he used it as a Clozeline activity, and knew immediately that I had to use it with my Spanish III students as we continue to focus on present indicative and past tenses with authentic resources. Little did I know how much my classes were going to like this song!! Using the idea from Zachary Jones, I decided to focus on the present indicative verbs as well as the preterite verbs in the song Inevitable. I always have music playing between the change of classes, as students are entering my room. On Thursday, the song playing was Inevitable by Samo. Sometimes students merely glance at my SMARTboard to see the video when they enter, other times they really watch. This was definitely the latter. I started class focusing on vocabulary activities for our current unit, telling them that we would be working with the song later in the class. I then passed out SAMO pres pret imp. Working with a partner, I gave the students about 30 seconds to identify what was in the two boxes. I then gave them about a minute to work through the verbs orally to identify them. Prior to listening to the song, we talked about the word, inevitable, in English, and I had them predict what they thought was going to happen in the song. I then played the song (without letting them see the video) and had them complete the cloze. The first time, I stopped after the first 7 lines to verify that they were clearly hearing the lyrics and that they just couldn’t write fast enough to complete it all. I then started the song again, and almost all of them successfully finished the song. We confirmed the verbs and then they worked their way through what they thought the lyrics were saying. Next, we watched the video. To say that they liked it is putting it very mildly. 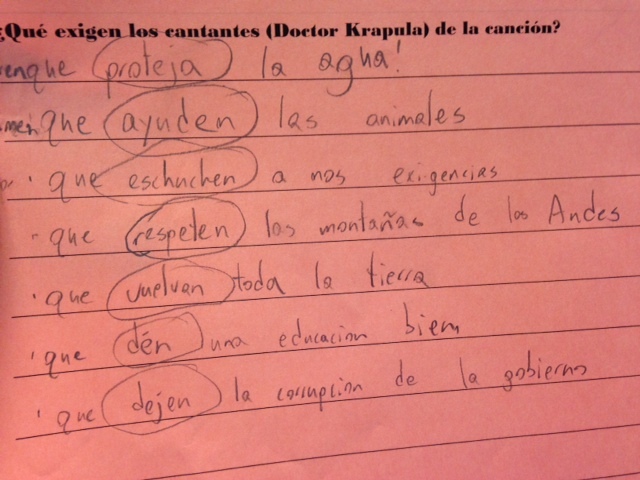 They asked to sing it in Spanish, which we did….twice….and the next day, too! 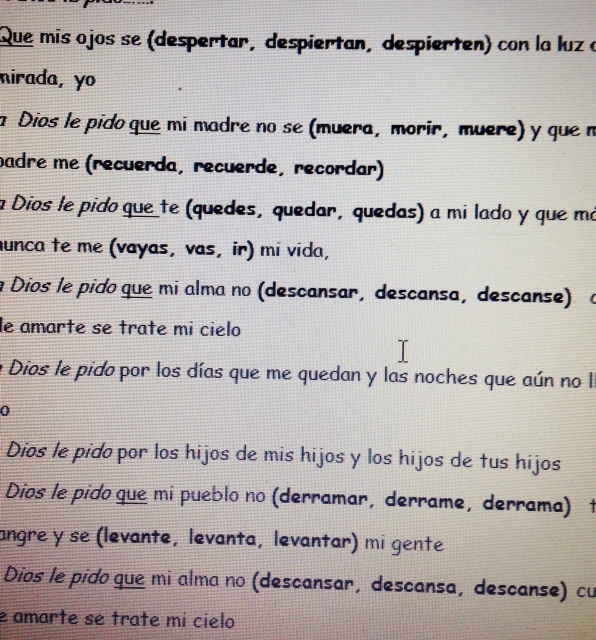 Because Spanish IV is working with the present subjunctive, I decided to use the song for them, also. The focus for them was present indicative, preterite and present subjunctive. I had them, with a partner, identify the three boxes as well as the meaning of the verbs (Samo pres pret subj). I then had them look at the lyrics in the first seven lines and tentatively guess what verbs they thought would complete each line. In all three classes, they chose almost all of the correct verbs prior to listening. Next, they listened and completed the cloze. I then had them focus on where the subjunctive was being used and, with their partner, they determined why it was being used. Finally, I asked them to try to say the lyrics in ENGLISH as the Spanish was playing: Bedlam! They practically begged to sing it in Spanish. Many of the students asked if they could download the song on their phones immediately! Of course I had to say yes! The next day, Friday, I used the much slower Samo song, Tú fuiste quien. This time, the focus was on past tense. I did not expect the Spanish III classes to enjoy this song as much as Inevitable, and they didn’t. However, they did like it. We will work with it again on Monday……at their request!